i gotta hand it to her . . .
you have to go take a look at what amy made. i’ve looked at it about 27 times and it still cracks me up. i know if i show it to david he will want one. no, i take that back, he will want one in cream and then one in chocolate brown. and i have to admit, that would be kinda cool. we haven’t decided on how we’re doing the dining room yet . . .
pear tree bloomed a little yesterday . . .
it’s not covered with blossoms the way it usually is. it got severely pruned in the fall, and then frozen in the beginning of april, just when the buds were emerging. but i’ll take these. these are perfect; what more could i ask for? in fact, the cherry trees, which usually bloom during april are also just now popping out some flowers. sigh. we don’t have any of those, but our neighborhood has some wonderous specimens. it makes the beginning of my bike ride soo much less creaky feeling. it was all i could do not to sleep with it last night on my pillow. i did my first sewn bindoff, which i hate. i did not enjoy doing this bindoff, and i really don’t like the way it looks and behaves; it gives the edge a very flabby structure with no body and not much recovery. i’ll probably take it out this evening and just do my usual bindoff. i had to model it myself, and then stretch my arms out as far as i could to photograph it on myself. those are the moments that i’m glad i have several hours of alone time in the mornings. i can get in and out of awkward positions before anyone is around to see . . .
i need to think up a good name for these socks; ears of corn socks just doesn’t have any panache, you know? i was thinking that it might be a good idea to name them after Ty Cobb. he knew how to have fun; i think he could’ve been a manLace wearer. tomorrow i’m going to show you the bee shawl swatches. i know i’ve been pretty quiet about them, but that doesn’t mean i haven’t made progress. i just needed to work on them off-blog for a while. but a lot of swatching has been going on—wait til you see . . .
in the process of swatching lace ALL last week, i ran into issues with my destiny needles. they are just not pointy enough for what i was doing, and until my addi lace needles arrive at the shop, i have to make do. so, i did the next best thing. i altered them. 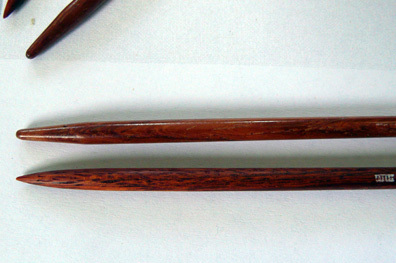 it’s a four-sided sloughing bar that you are supposed to use on rough skin. 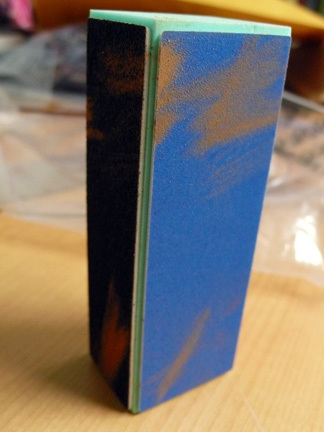 it has a progressively finer sanding surface on each side. it does not rough up the wood, but sands it gently, almost buffing it by the time you use the finest surface. finished off with a coat of beeswax, or carnauba wax, and you have a nice smooth result. a pretty pointy tip for picking up fine merino yarn. i played a little with just how sharp it needs to be for this project. while most lace maneuvers don’t require this kind of point, there are several that do, and it’s handy to have a needle that will handle those. i may go back in and taper the area below the point a little more, but really, this is sufficient. and, if later i decide that the points are just too sharp for most projects, i can easily knck these back a bit and round them off for working with other yarns. i have always hesitated to mess around with the points of my good wood needles, but i’m glad i tried it. of course, i would prefer that they arrived this way from the shop, but if not, this is a viable option. david’s favorite tulips bloomed today, just in time for us to celebrate—ten years since our first date. it feels like half that. the last word on april . . .
Beautiful tuilp! And very nice socks! You are a brave woman for roughing up your needles like that. They look great. If *I* did that, I’d have to go out and buy new needles to replace the ones I’d messed up!!! I love the man lace socks and as I’ve said before, that yarn is stunning! You rock the lace – even the Man Lace! After a few sojourns to the flower fields of Amsterdam, I thought I’d seen every kind of tulip. Not so. This is nature at its best, and for such a notable occasion! Nice job on the needles. I’m sure they’re a lot more useful now! That looks like a great tip on your needles! I love how you can see the grain thru, like its not marred at all. Happy date-aversary 🙂 Many, many more! Congrats on ten years! My husband celebrates the anniversary of our first date more than our wedding! It’s very sweet. The newest man lace is great, just enough texture, but not too fussy. Ty Cobb, heh. 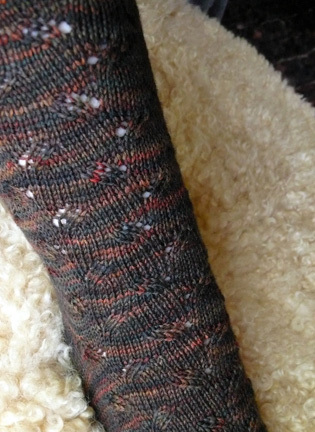 Beautiful blooms, fabulous socks (how about Sheaths of Corn!? ), can’t wait to see the bee shawl swatches, and you were certainly clever fine tuning the needles. A happy May Day entry. You are a trailblazer, and now maybe I will be brave enough to alter my own needles if and when it is needed. I sometimes have problems with the needle points just pushing the yarn instead of going into the stitch. Oh yah…. and I really like the socks. I’d be interested to know how those needles that you filed to a point work out. Especially if you try to round them out again. Go with Ty Cobb. 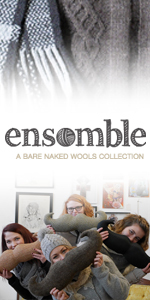 It is a wonderful pun, and will get across the point that it is ok to knit this pattern for a guy. How’s about the name “man lace” it says it all !! they are certainly looking gorgeous. Eh, that’s corny. Plus, they kinda used it for a KAL last year. Anyway, that link to the giant glove? Hilarious. And congratulations on your anniversary! 10 years, my oh my, congrats!!! From Pear blossom, to manlace, to needles to tulips and 10 year anniversary. Great idea on the needles. What a difference! That tulip is beautiful! Have never seen on like it. That chair glove is amazing, thanks for the link! My flowering crabapple is almost in bloom but not quite yet. Love the tulip. 10 years flies by, that’s for sure. Dale and I will be married 10 years this June and I can’t believe it. Love the socks! Funny how 10 years can feel bot hlong and short at the same time! Congrats! Lovely sock! The yarn is delish! Happy date anniversary. And thanks for the link to the glove. Whacked! What a beautiful tulip! I can’t wait to see the bee shawl swatches, i have a feeling I’m going to like them! Congrats on 10 years! i think that deserves a hand knit hand chair…. Also – love the man lace socks! 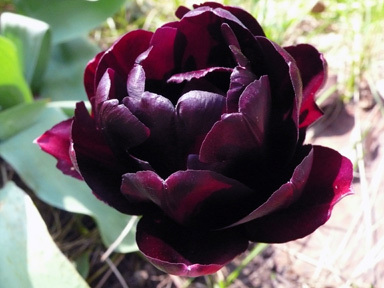 That is such a beautiful tulip, someone should dye up a lace yarn in that colorway! The man lace socks are amazing, Ty Cobb would be a great name, I remember a thing on NPR about him, and he sounded like a very interesting person! Aww, congrats on the date anniversary! It’s wonderful when it feels like you’ve known someone forever, but yet it feels like it hasn’t been that long! 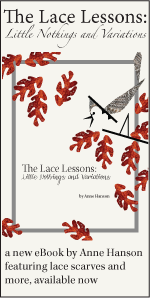 The man lace socks are wonderful – stretched out they look totally different! I took your advice and bought the “big book of knitting stitch patterns” and LOVE it…so much inspiration! Hi Anne — Congratulations on ten years! and that beautiful sock and your needle handiwork. You are truly a renaissance woman! I hear the Addi lace needles are to die for but it looks like you whipped those wooden needles into shape. I have heard that Sewer’s Aid also is a good substance to put on the needles after sanding. Maybe you could call that design the blue corn socks, given the lace pattern and the color. Just thinking. I like the Ty Cobb idea as well. between the corny socks and the tulip, my day is much better already. I have one of those four-sided buffers for fingernails. It was in my xmas stocking this year. I thought this was very funny since I never, ever bother to do anything with my nails. But I tried it, and I really liked it–my nails were shiny as mirrors. Impressed I am that you would mess with the terrifying expensive destiny needles…but having seen the results……. And you were SO right about the superwash. Is a weird combination of slippery and grabby. The end result was pretty. But not fun. 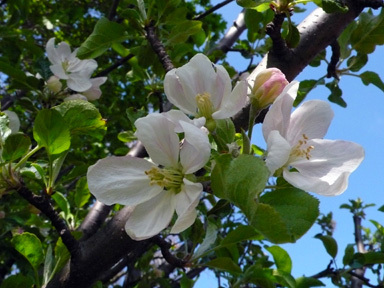 I hope your pears are more intense and beautiful, even if you have fewer blossoms. I know that sewn bindoff looks like assbeagle (thanks, Rabbitch!) at first, but its manners are greatly improved by washing. I think Ty Cobb makes a good sock honoree, and I LOVE the socks, as I did last time. I love that ears of corn stitch pattern. But oh! the tulip is divine. Lovely tulips! The ‘man lace’ socks are great, they look totally different on the foot. I submit the name “Huitlacoche”; although its a bit of a tongue twister. It fits the corn motif and the color is perfect and pretty accurate. Nice flower pix! I want those socks, but for me!! MEN! BAH humbug! Congratulations on ten years! We’ve been married 10.5 years now, dated almost a year before the wedding. Isn’t it nice to settle in to a comfortable alliance? My life is so much better with the balance of Brian in it. I hope you got a special time together even if it was a quiet time at home. what is it that you call a “sewn bindoff” ? 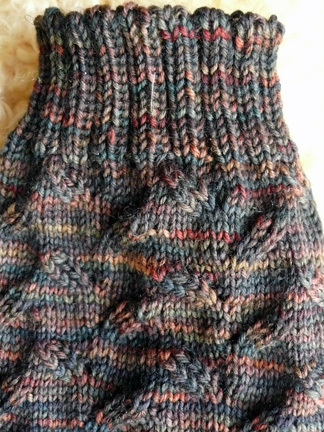 i’ve done the kitchner st. bind off (all the knits are on one needle and the purls on another needle, and then it’s like doing regular kitchner st.). i’ve been away too long … i have lots of catching up to do! Gorgeous tulip. How sweet 10 years! Lovely. 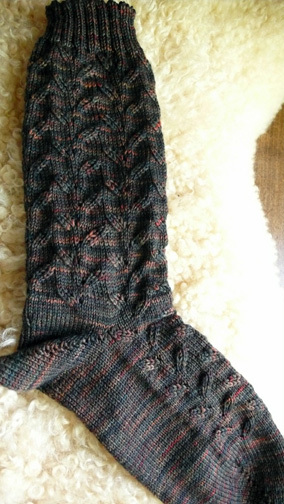 The manLace sock is gorgeous too. I adore that color. I dunno a/b manLace though. My sweetie still wouldn’t go for it, but that’s ok, more for me, bwhahaha!